Lucas Revano of Camden Catholic has 157 career wins, second all-time in school history. The drive from Lucas Revano’s Belmar home to Camden Catholic is about an hour and 15 minutes each way. It left plenty of time — one might presume — to ponder whether it was all worth it. Wrestling by its nature requires sacrifice and discipline — cutting weight and fighting through pain. A nearly three-hour commute on top of that sounds almost cruel for a teenager. But that’s the part Revano seems to have never even considered. He’s just doing what he loves. It’s true that Revano — this year’s Inquirer wrestler of the year in South Jersey — was one of the most gifted wrestlers in recent area history. But what really separated him was his passion for the sport, an unyielding dedication to finding out just how great he could be. Revano was one of the nation’s highly touted up-and-coming wrestlers as far back as middle school. He chose Camden Catholic because he loved the coaching staff and the atmosphere and the storied history of the program. He envisioned adding his own chapter to that history. Lucas Revano defeats Ricky Cabanillas of DePaul in the state tournament. It was a goal he accomplished in spectacular fashion during a senior season in which he overcame injury to win a second consecutive individual state title and fourth straight district and regional titles. His 157 career wins rank second all-time in school history. He also helped Camden Catholic to a Non-Public B state championship — the team’s first state title since 2013 — as the Irish went undefeated in New Jersey for the season. 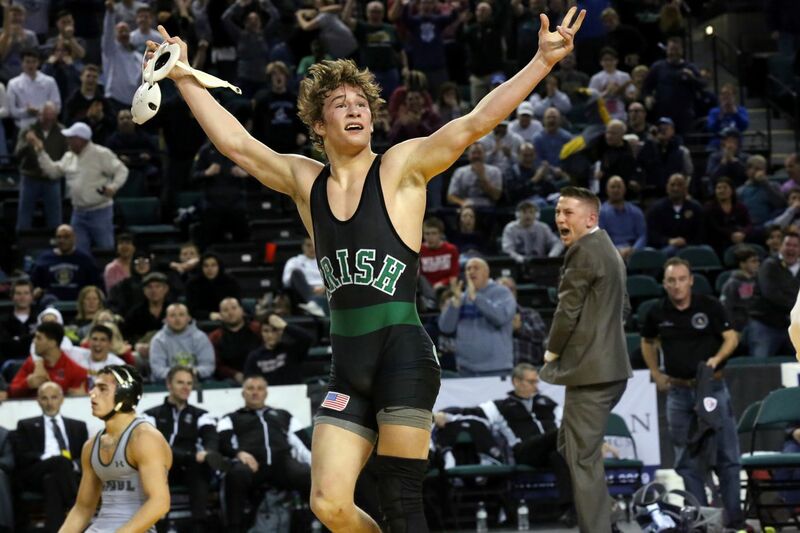 Revano’s championship bout in 145-pound state tournament was the highlight of the entire weekend in Atlantic City, a bout those in attendance won’t soon forget. His opponent, DePaul’s Ricky Cabanillas, was himself a defending state champion. But Revano pinned him in thrilling fashion in overtime. The individual state title was particularly sweet as it came on the heels of an injury that nearly derailed Revano’s entire season. Revano sprained his left MCL at the Beast of the East tournament in December. The injury sidelined him for more than a month. It setting the stage for a recovery that was owed, more than anything, to sheer will. Walsh said that Revano’s work ethic set an example for his team and helped set a tone for the program’s overall stellar results. And inside the Camden Catholic wrestling room, more than his accolades, the example he set might be his greatest legacy. Revano celebrates after defeating Ricky Cabanillas of DePaul. “It was an awesome year. We accomplished almost everything we set out to do, and it’s because we were able to just put in the work,” said Revano, who will continue his wrestling career at the University of Pennsylvania. “I’m just thankful for everything I’ve been given.